Welcome to Cotopaxi, an active volcano in the Andes! Cotopaxi is an active volcano in the Andes Mountains located about 50 km (31 miles) south of Quito. It is the second highest summit in the country, reaching a height of 5,897 m (19,347 ft) and is one of the world’s highest volcanoes. Since 1738, Cotopaxi has erupted more than 50 times resulting in the creation of numerous valleys formed by mudflows around the volcano. The National Park protects the landscape as well as a myriad of bird and mammal species, including wolves, pumas, bears, rabbits, Andean condors, wild horses, and foxes. Keen climbers and trekkers arrive to Cotopaxi from all corners of the world, excited to explore its unique landscapes and to try and capture some of the park’s wild spirit. Today we will climb the Pasochoa peak. At 4,200 meters this is a challenge that will get our engines revving in anticipation of the second part of our adventure. Access is not difficult and our hike to the peak will take about 3 hours over grassland trails. 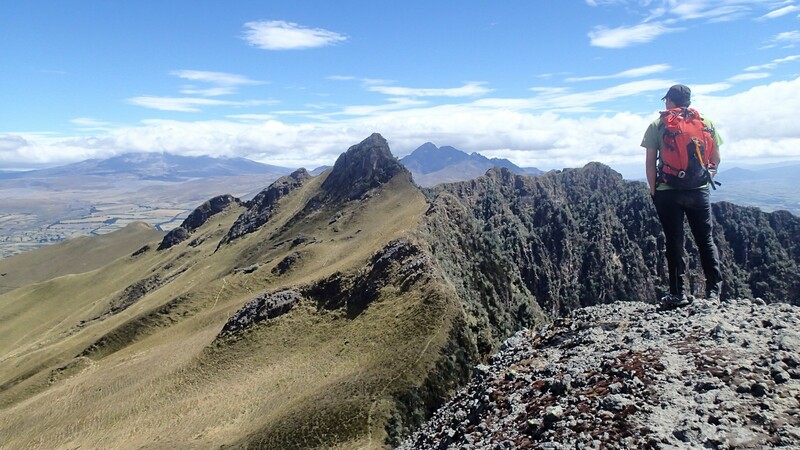 From here you will get a spectacular view of the mountains surrounding Quito, the inspiring scenery of the Pasochoa crater, as well as the impressive surrounding mountain crests: Antisana, Sincholagua, Quilindaña, Cotopaxi, Rumiñahui, Corazón and the twin Iliniza peaks. The second part of our day consists of the descent to the Pita river canyon, a downhill walk of about 3 hours through grasslands and low ‘Chaparro’ forests, ending at the Lodge, situated at about 3,200 meters above sea level. Today we head to Cotopaxi National Park, one of the most beautiful protected areas of Ecuador. 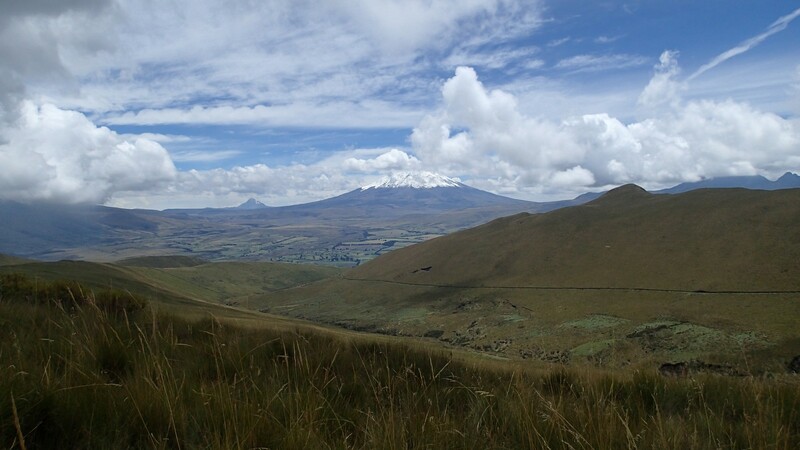 On a clear day, you might see Cotopaxi’s peak from parts of Quito, but its majesty is only clearly revealed from within the borders of the park. When the weather cooperates, views of its snow-capped, nearly symmetrical summit cone are awe-inspiring. We start at the Pita River. This river gives life to hundreds of thousands of Quiteñios (as Ecuador capital city residents are known), and its source is the pristine glacial meltwater of Volcan Cotopaxi. Its rushing waters will guide us throughout much of our adventure. This is a special and beautiful hike, but it’s more than just the beauty and activity. By hiking here, we are working to conserve the Pita River. We hike to raise awareness for both locals and visitors alike about the importance of this water, how conserving it is important, and how melting glaciers will impact our population. The hike enters the Cotopaxi National Park towards an archeological site called Pucara de Salitre, where we can see a variety of migrant and resident Andean bird life. On the way, we might see some of the wild horses, deer or llamas that make the park their home, as well as gorgeous seasonal mountain wildflowers and breathtaking scenery. We will spend time at the water’s edge of the Pita and the natural springs at the park, admiring classic views of Cotopaxi Volcano or perhaps the reflection of Rumiñahui Mount in its waters. During our adventure, we will stop to enjoy a picnic in the crisp alpine environment. 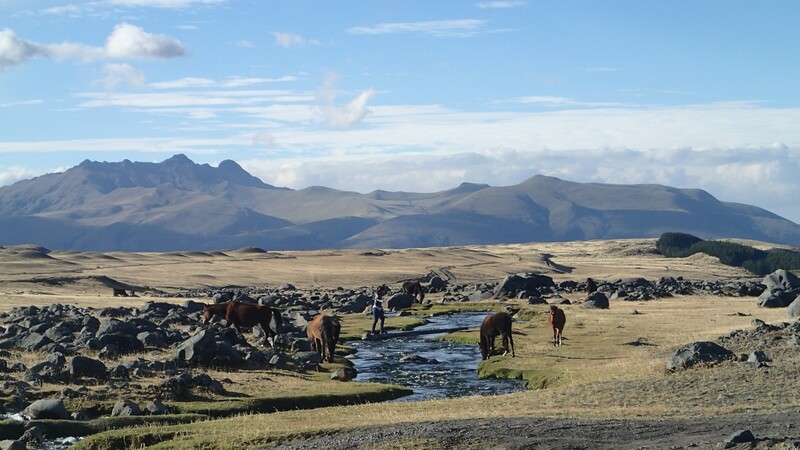 We will finish our exploration at our next cosy mountain lodge, Tambopaxi. Hiking time today is approximately 5 hours. From the lodge this morning, we will drive in our private vehicle to the parking area of the Cotopaxi mountain refuge. We will then walk for approximately an hour before reaching the mountaineers’ lodge, and hike from there to the edge of the glacier, a walk of approximately two hours. From here, the northern side of the mountain offers a spectacular panorama. You will be able to identify (with the help of our guide) all the ground we have covered since the first day of our adventure: Quito, its valleys, the distant mountains in the north, and the road from Pasochoa, through the Pita canyon, to el Pedregal, Sincholagua, Rumiñahui and the magnificent Limpiopungo valley. The descent, which will take approximately 2 hours, takes the same route back to the parking lot and we head back to Quito by private transfer. At Chilcabamba Mountain Lodge you can feel the stillness of the Andean highlands. It’s a rugged, awe-inspiring place, where the birds float ever-higher on the mountain breezes. It is a sacred and silent place that offers peace and solitude. Even breathing the high alpine air can be a restorative experience. The atmosphere will change you, filling you with energy and allowing you to rediscover your essential self. Built from local materials, Chilcabamba is cozy, unpretentious and charming. The lodge lies in a gentle valley circled by the rugged peaks of four towering mountains. The lodge is the perfect base for getting to know the magnificent surrounding countryside – on foot, horseback or bicycle. Here travelers can explore a natural wonderland, sipping its crisp, refreshing air and taking in its magnificent vistas. Lodge rooms are equipped with a wood burning stove to keep you warm at night, along with cozy ponchos and thick duvets to keep off the mountain chill. Views from every room are beautiful and make the most of the lodge’s incredible setting. The main lodge is welcoming, with cozy nooks to relax, books to curl up with, and stunning views of Cotopaxi on a clear day. At night, you can sit by the campfire and gaze at the stars. Our chef prides himself on his creative and varied cuisine. One thing is certain – you will be fueled for your adventures! Coming back to the lodge after a long day of adventure and being welcomed by a piping hot bowl of Ecuadorian soup is the perfect way to warm up and excite your taste buds for the upcoming meal. In the foothills of the majestic Cotopaxi Volcano and surrounded by an imposing frame of five volcanoes over the Andes, is Hostería Tambopaxi. A comfortable and welcoming place ready to welcome our many guests from around the world in search of adventure, sport, wellness or rest. Tambopaxi is the only ecotourism resort and acclimatization center situated at an altitude of 3,720 meters above sea level in the heart of the Cotopaxi National Park, which has a pleasant restaurant, rooms with private bathroom and camping area. It enjoys a spectacular landscape, not only the Andean plateau with all its flora and fauna, but also the largest volcanic area of Ecuador, making it the place chosen by expert geologists, mountain climbers, sportsmen, families and tourists of all ages.